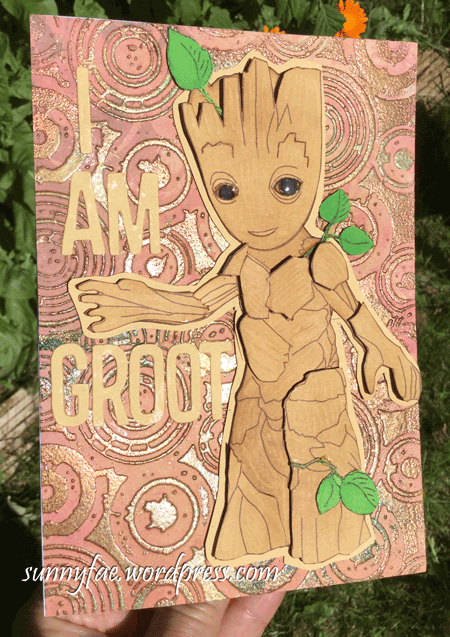 This was a card I made for a young family member (Happy Birthday!) I’m never sure what teenage boys are into and find making cards for them quite difficult; this seemed to go down well though. 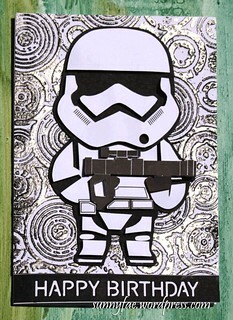 It is a 3D Decoupaged card made the same way as the yoda and stormtrooper cards I made last year. Can’t believe it’s a year since I made them, where does the time go! Hi there. Christmas day came and went off successfully and we are all now very happy and very full. Hope your Christmas was equally successful. 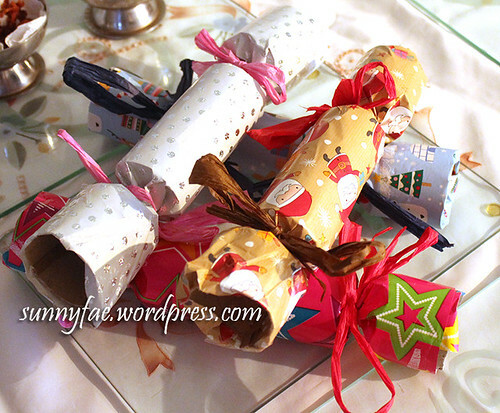 The only hitch we had was Christmas crackers, as in some body forgot to make any, eeep. Luckily the kids came to the rescue and said give us some ”stuff” to make them and well do it. I had hats, wrapping paper (from the many now opened gifts), toilet and used wrapping paper rolls (from the recycle box), a small box of wrapped chocolates and a small packet of cracker bangers. I put them in a small pile in the middle of the room and left them both to it. This is what they made. 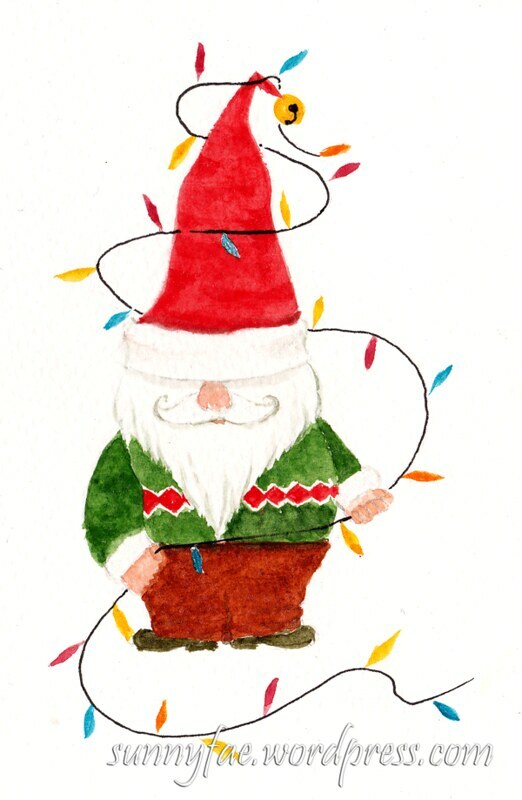 No fancy ribbons paper or even dies. Just made the way we used to make them when we were kids (all those years ago). We didn’t have jokes to put in so decided to all tell any joke we could think of, yes the jokes were terrible, worthy of any Christmas cracker we’ve ever pulled. We had so much fun doing this I think we may do the same thing next year. Hi there. How are you. I’m not panicking yet eeep! This week I have been making gift toppers, lots of gift toppers. The big wrap is coming and I wanted to get everything ready. I used white gold and silver card plus some items from my recycling box (old wrapping paper and coloured envelopes from a recent birthday.) No point in throwing that stuff out when I can use it. 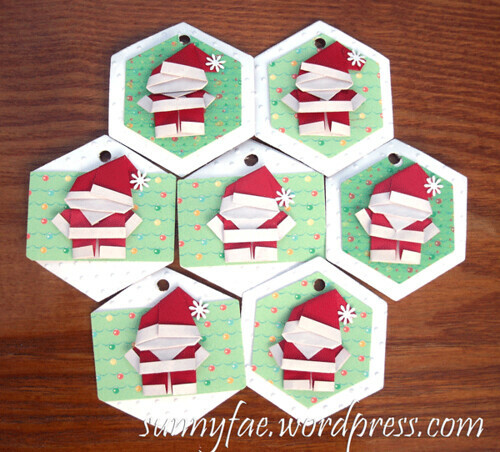 To start with I die – cut lots of snowflakes. The snowflakes were folded along the centre and the “arms” (if that’s what they’re called?) it gives them a little more dimension and shape. I stack them biggest on the bottom to smallest on top and the colours alternated so they stand out better. They are glued in place and put aside to dry. 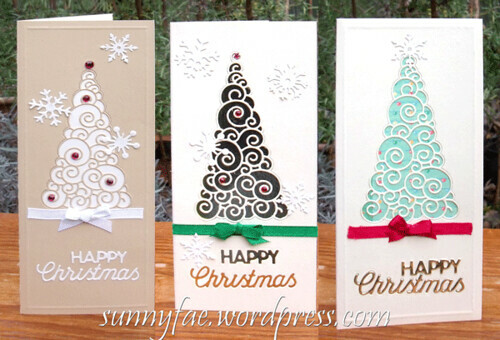 The bases of the toppers in the first picture is a spellbinders Persian Motifs die cut in white card. 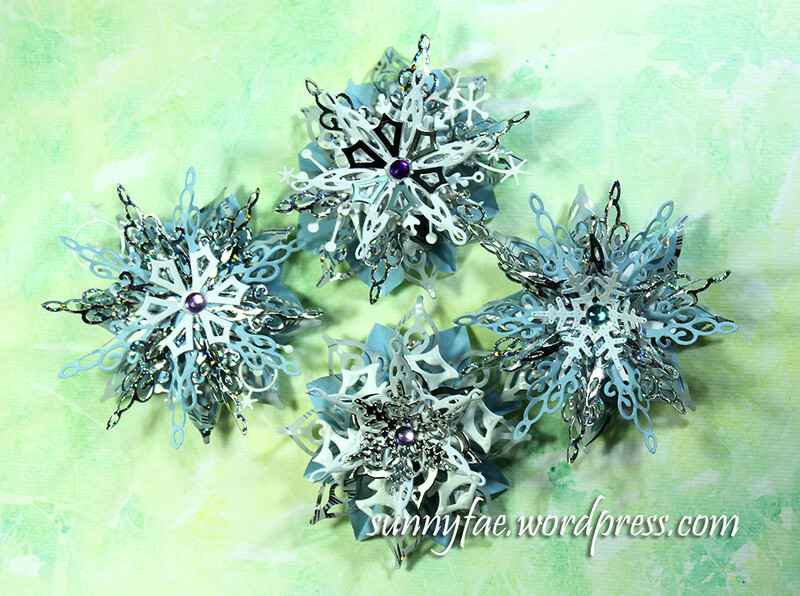 The little stack of glued snowflakes are then added to the top. these were the simplest to make and the largest. I also made some with smaller bases. 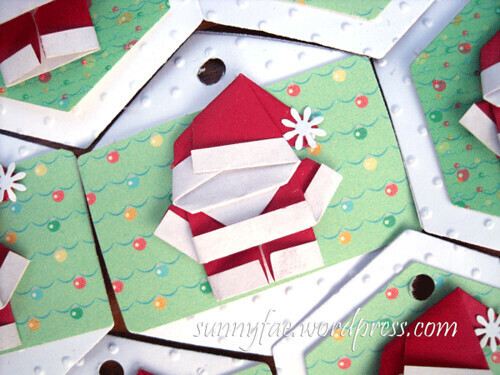 The base of the second set were made out of a piece of wrapping paper cut with a spellbinder strip die and a peace of blue envelope that had been folded into a concertina in line with the points of the die – cuts and cut at roughly 1 1/2 inch lengths diagonally so they are pointed at one end and straight at the other. The two strips were layered on top of each other and glued into a circle which in turn was pushed down into a small rosette about 3 inches in size. To stop them from pushing back up again I glue a small circle of card on the bottom and weigh them down with a small coaster till they dry. The little stack of glued snowflakes were again added to the top. 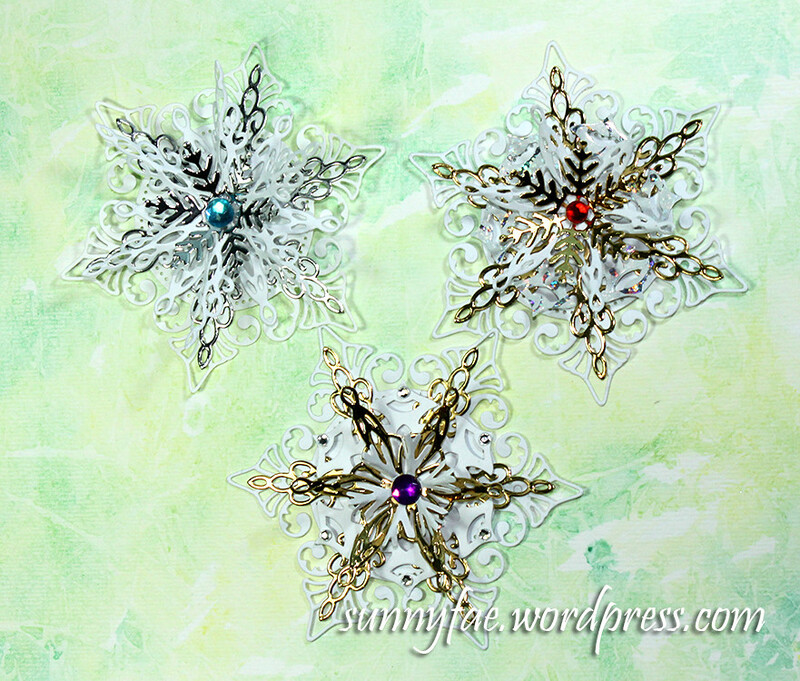 The third set were made from a craft coloured envelope cut with the same spellbinder strip die made into a rosette, a gold/silver die from the same set(Persian Accents), and a paper poinsettia on top. 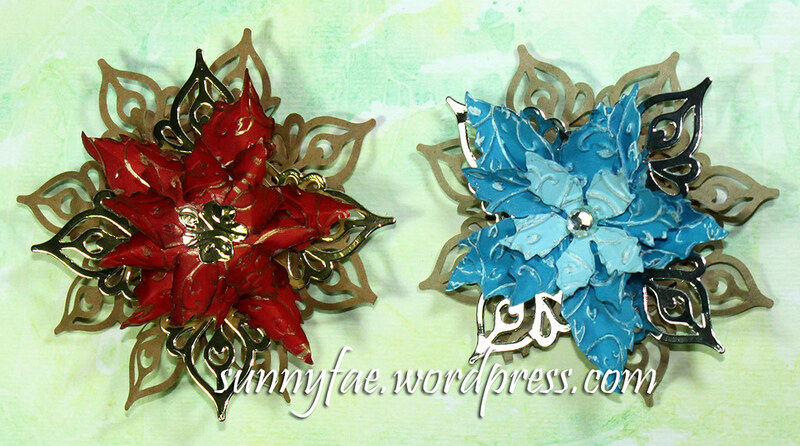 I explain how to make the poinsettias here, the only thing changed are the colours. I put little gems in the centre to finish them off, cos you have to have bling at Christmas, that has to be a rule doesn’t it? That’s another thing off the list of jobs to be done. I always think I’ve started early enough and it just gets away from me but “determined” is the word, have to get my head down and get on with it! This is a card made in the same style as the little tag I made way back in June.The colours are slightly darker and duller because the tissue was a little darker but I used the same method to make it. The topper card was embossed with a Swiss Dots embossing folder and was then matted and layered with red card onto a card base with foam pads. 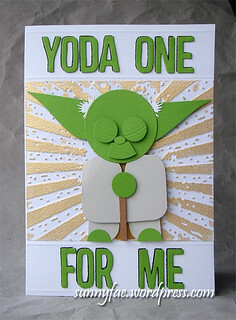 For this card I used a couple of dies that came free with magazines. I used the dies I had but similar dies can be bought and used in place of them. 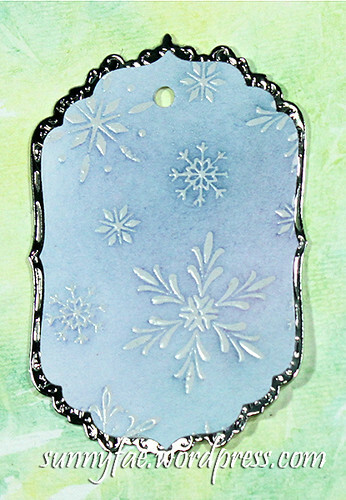 The daisy border was a half daisy Tattered Lace die cut on top, rotated and used again to cut the bottom. It’s a bit fiddly but I like the result. The smaller blossoms were made with a single strip die. You’re supposed to wrap the paper around and round till it makes a quilled flower. It doesn’t seem to matter how I roll or curl it they always look so scruffy, so I decided to try and simplify things a bit. I cut five of the petals from the end, rolled them into a circle and glued the edge. 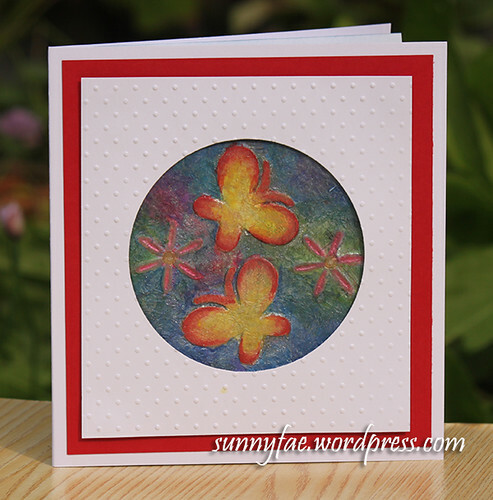 The bigger flower was a crafters companion simple five petal flower die. The centres are dandelion clock dies. I used them because they remind me of cherry blossom stamens. 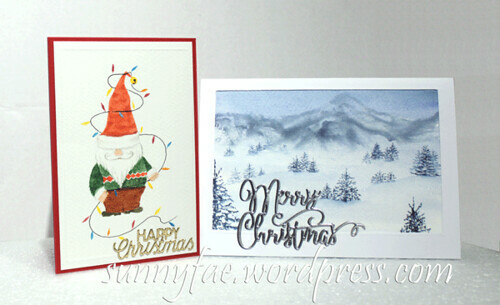 The background is made using a Swiss Dots embossing folder. 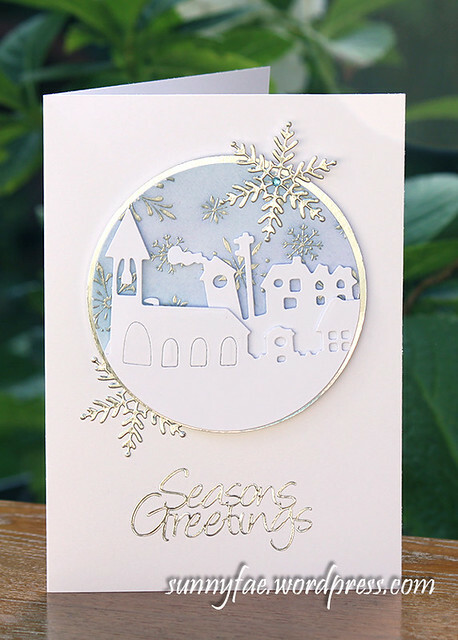 It’s a long card so I embossed one side then flipped it around and embossed the other end. I wish all folders were as repeatable as this one. 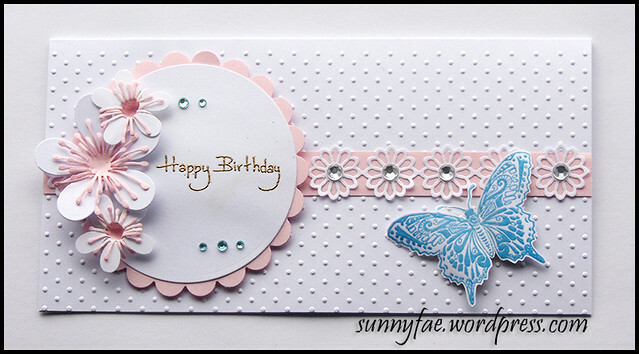 The butterfly and sentiment are stamped out and heat embossed.Then all things were cut out and glued into place. Gems were added for a little sparkle. Writing things down always seems to make it look far more complicated than it really is. I like the texture and the small splashes of colour. Little things like this make me happy. The other day my daughter and I picked blackberries. It’s getting late in the season but there’s still a few left and maybe, if we can, we will pick a few more soon. They taste really good with strawberries and a little yoghurt. The cold days are now starting to close in now, the nights are getting darker and autumn seems to be on it’s way.